Recently, our technical support team has received scads of e-mails about YouTube to Samsung Galaxy Note playback issues, among which the most distinctive one is "how to convert YouTube to recognizable format for Galaxy Note 4/5/7/8/9?". On account of this common problem, it seems of necessity to specifically clarify this problem for the masses of users. Here this article below will show you how to easily download and convert YouTube to Samsung Galaxy Note 4/5/7/8/9 friendly format with blistering speed. To save YouTube videos onto Galaxy Note 4/5/7/8/9, the precondition is to find out a reliable yet versatile YouTube converter. 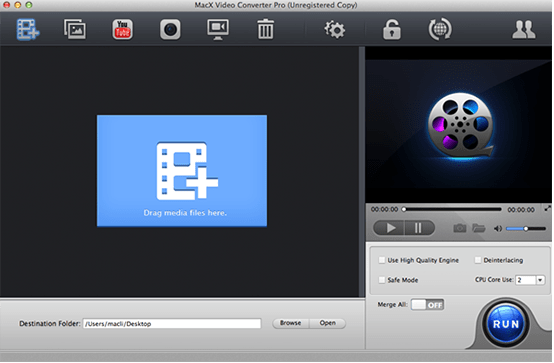 The good news is that there is a highly acclaimed YouTube dowloading program called MacX Video Converter Pro, which will faultlessly download and convert YouTube videos to Galaxy Note supported format, from 720P, 1080P, 4K HD, vr 360, bluray YouTube video to Galaxy Note 4 MP4, AVI, M4V, MKV, 3GP, etc. with merely mins on Mac (macOS Mojave) and PC (Windows 10). Accolade as the powerful Swiss Army knife, this YouTube to Galaxy Note 4 video converter can also allow you to perfect convert any video to Samsung Galaxy Note 4/5/7/3/8/9, Galaxy S9/8, iPhone X/8/, iPad mini 4/Air more with the fastest speed by taking advantage of hardware acceleration tech. 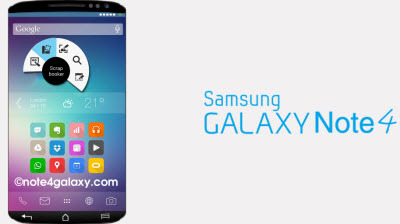 It can free download a music video from YouTube to Samsung Galaxy Note within 30 seconds only! Note: This fabulous 2-in-1 Samsung Galaxy Note 4 video converter works seamlessly for Mac users to download and convert YouTube for limitless playback. Free download the YouTube converter. If you are running on Windows operating system, please head for the Galaxy Note 4 YouTube converter Windows version for assistance. After free downloading and running this Galaxy Note 4 YouTube Video downloader converter on Mac, hit the "YouTube" button on the main interface, the built-in YouTube Downloader window will pop up automatically. Copy and paste the YouTube video URL to the address bar and then click "Download Now" button to begin the video downloading job. Step 2: Convert YouTube to Samsung Galaxy Note. After finishing YouTube downloading, the downloaded YouTube video will be automatically added to the convert list. You can choose to convert YouTube to Galaxy Note 4/5/7/8/9 MP4 video format as MP4 file format keeps the good balance between video quality and file size, or choose "to Samsung Galaxy Note 4 Video" from Android Mobile profile as output video format. And if you want to extract the audio from the downloaded YouTube video, you can also select converting YouTube to MP3 Galaxy Note 4/5/7/8/9 acceptable format for using the audio as ringtone or something. 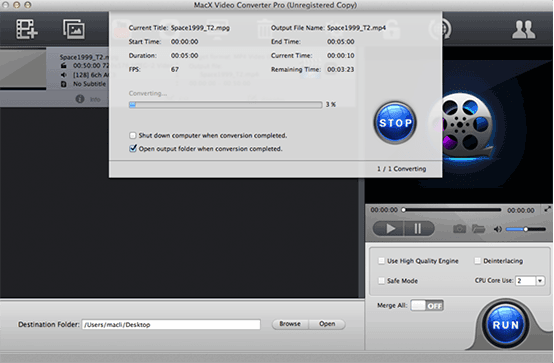 Click the "Browse" button and choose the location where you would like to save the output video file. Press "RUN" button to start YouTube video to Samsung Galaxy Note 4/5/7/8/9 converting process on Mac (Mojave or earlier). 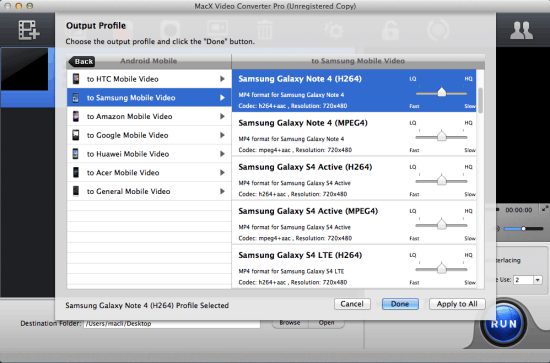 Tips: Beyond seamlessly downloading and converting YouTube to Galaxy Note 4/5/7/8/9, MacX Video Converter Pro also cuts the buck to convert your HD camcorder videos from Canon, Sony, Panasonic, etc, like converting Multi-track videos M2TS, MTS, TS, AVCHD, MKV to MP4, MOV, AVI, FLV, etc. so that you can enjoy the recorded HD videos on Samsung Galaxy Note 4 as well as Apple Sony Microsoft devices at one stroke or upload HD video to YouTube, Myspace, Metacafe, Facebook for sharing with others.